If your business charges for work by the hour, use QuickBooks time tracking to simplify invoicing your customers. Watch this to learn how. Choose the person whose time you’re tracking. Choose the customer who you’re billing for this time. If it’s a new customer, click Save to save their name. You can go to the customer’s page later to enter additional information. Then add whatever Service Item was provided. If this is a new service, type it in and click Add. Then enter information about this service. In the Product or Service Information window, choose the Income Account. This is not a bank account, it’s a bookkeeping account. Click Save. Then enter the daily hours worked. You can add a new line for each customer you worked for this week. And when you’re done, just click Save to return to the Homepage. 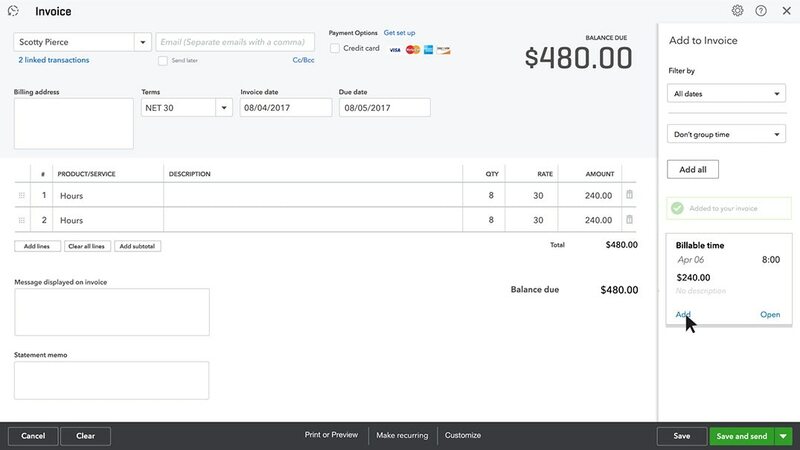 Go to the Plus Sign Menu and under Customers choose Invoice. Enter the customer’s name and click Add All. Repeat this as needed for other customers.